Hedgehogs have become increasingly popular pets, but if you would rather have a pet you would love to cuddle but not have to feed, water or clean up after, then snuggle up on the couch this evening and crochet your own hedgehog. Made using basic stitches, this project can easily be created by someone new to crocheting. The head and body of this sweet little critter works up in one piece, but the magic really happens when his hair is attached with a latch hook tool, using the same technique as when hooking a rug. Click on the photo to download the pattern and print the instructions. If you are having trouble downloading the pattern, use this guide to Adobe printables to help you. This hedgehog pattern was designed to be a relaxing project. Use the following tips for ease in assembly. When stuffing the body, firmly stuff the nose first to ensure a prominent shape. To prevent catching shorter ends in newly attached hair, do not trim the hair until you have finished hooking the entire body. The instructions call for leaving yarn tails to sew the feet and ears to the body. If desired, only one yarn tail is needed on one foot and one yarn tail on one ear. Simply insert the needle through the body from one foot to another, and one from ear to ear. A bulky weight yarn with blended colors of your choice can be substituted for two strands of worsted weight yarn. 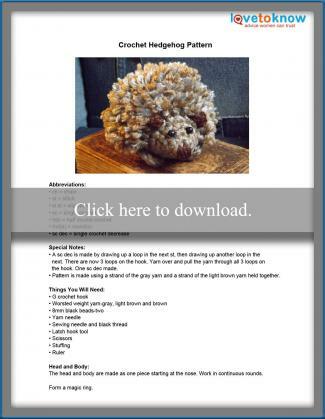 Whether you want to make a toy, a decorative accent for clothing or a peaceful pet to sit by your side, there are plenty of free hedgehog crochet patterns to choose from. Browse these great offerings for some fun options. 1 Dog Woof has an adorable hedgehog taggie toy for a teething baby. This is a quick and easy project suitable for a crochet beginner. Drunken Aunt Wendy Designs does not disappoint with this cute hedgehog. His hair is created using a loop stitch. This pattern requires a crocheter with intermediate crochet skills. Repeat Crafter Me has included a hedgehog in her 26 Days of Crochet Animal Alphabet Appliques. This "H is for Hedgehog" applique can be worked up quickly and would be a fantastic project for teaching a new crocheter basic stitches. These adorable hedgehogs make great gifts for kids of all ages - and many adults too! Crochet a herd of hedgehogs to have on hand whenever an occasion occurs.